Protective plastic wrap- or bubble wraps, if you will- are rolls of materials that help keep your things safe from collision damage. They are used to pad items and offer an extra layer of protection while they’re in transit. 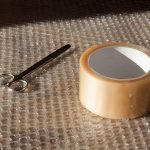 A wide array of items can be wrapped in bubble wraps, and they don’t leave any residue on your stuff as well. Markers help to inscribe labels on your boxes this way, you’ll be able to identify what is in a particular box, and your whole unpacking process will be made much faster. When it’s time to move, you’ll definitely find things easier with zip ties. Zip ties help keep things like cables and wires intact and tied orderly, thereby making their unpacking and installation much easier when you get to your new home. When moving, you will definitely need to have a lot of Ziploc bags in hand. Clear Ziploc bags are ideal for putting together items that are used (or at the very least, made) together. All you will have to do is have them put in one Ziploc bag, have the bag labeled and stored carefully away. They make it easier for you to find your things as well. Sliders are just plastic disks. They work for when you have heavy pieces of furniture to move. If you want to move things like bookshelves, file cabinets, chairs, etc. without exerting too much energy, these will do pretty well for you. Regardless of whether you’re moving across the street or you’re moving to a far place (perhaps across state lines or to a different country) you will need to have your stuff transported. If that is the case, a moving box is definitely essential. You can easily organize your stuff, and your chances of losing anything are much reduced. With tape, you can easily seal off moving boxes and ensure that your items are kept safely enclosed in these boxes. Just as it is with tape, glue is a sealing agent that is definitely essential. It makes sealing fast, secure, and much stronger. However, if you have either glue or tape, you should be able to get optimum results.